Do you remember the 1980 Olympics when the USA beat the Soviet team in the semi-final hockey game? Last night at the Smucker's Stars on Ice 25th Anniversary tour opening show in Lake Placid's Herb Brooks Olympic Arena in Lake Placid,...I believe I could still hear "USA, USA, USA!" chants! Here Kurt Browning on the left has just introduced Scott Hamilton on the right. There was deafening cheering and a standing ovation for Scott when he skated to center ice. He then took time to recall the past 25 years and the skaters whom we all remember. And the final circle of the ice waving to the audience. Another standing ovation! Watch your NBC television programming for January 22,... the show was taped to be broadcast. ... to the 33 miners in Chile! Now we just have to see the rescue workers all make it to the top and it will have been a perfect 24 hours. And, on edit,... everyone is now above ground and safe. Way to go! Two weeks ago I traveled south west from the Adirondacks to Bainbridge, NY, to attend a concert by one of my favorite bluegrass bands, Remington Ryde. The community of Bainbridge and the volunteers who have given new life to this beautiful old building are most welcoming. It was a great evening Ryan, Billy, Wally and Danny! I'm sure I'll be going back again. The next day's drive home included a bit of a side trip to see East Sidney Lake. I'll be watching to see what the coming schedule is for concerts. It's a bit of a trip, 4 hours drive, but well worth it! And soon it will be gone for another year. Looking back, but still looking forward! 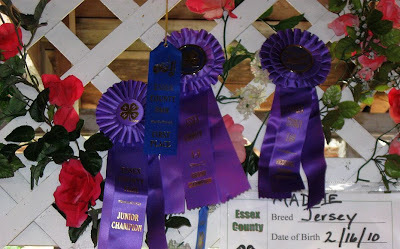 This past week was our county fair. One of the exhibits was a John Deere dealership. My almost 12 year old grandson went shopping! He works on his father's dairy farm and mows lawns for others including me. He had saved $750 for a down payment and his mom and dad signed for the rest on his behalf. However my grandson will be making the payments. He's now in business! Mowing my lawn with the new machine! He's a very hard worker, last year he bought himself a four-wheeler. And as you can see below he takes care of his machinery. After using the hose on the blade via the built in wash system, he turns it completely off and hoses down the top of the deck. He knows how things work, he can fix things and is very conscientious about safety. Wise beyond his years! With this motivation I can see that he'll have a nice sum ready to start college with. Meet "Maddy".... a lovely young lady! Here is my youngest grandson who is very happy with the blue ribbon he just won with Maddy at the fair!